Sue Lawley's castaway is leader of the Conservative Party David Cameron. 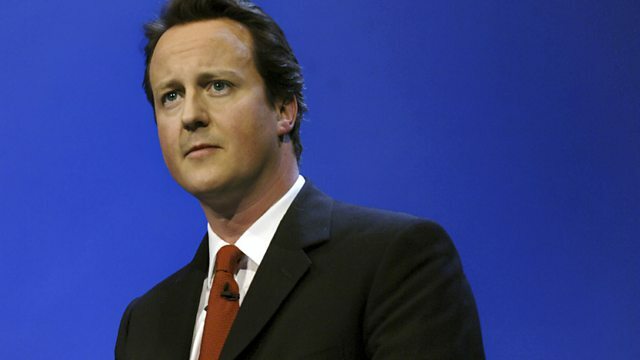 Sue Lawley's castaway this week is Rt Hon David Cameron MP, Leader of the Conservative Party and Leader of the Opposition. He was elected last December, beating his rival David Davis by more than 70,000 votes. Educated at Eton and Oxford, should he become Prime Minister, he would be the first Conservative Old Etonian to do so since Sir Alec Douglas-Home in 1963. He grew up in West Berkshire, the son of a stockbroker father and a mother who was a magistrate. After graduating with a First in Politics, Philosophy and Economics, he joined the Conservative Research Department in 1988, where he witnessed the downfall of Margaret Thatcher. He became special adviser to the former chancellor Norman Lamont and was at his side on Black Wednesday. His own political career took off in 2001 when he was elected MP for Witney. From the beginning he was tipped for high office and in 2004 he joined Michael Howard's shadow cabinet. He divides his time between homes in London and an Oxfordshire village, where he has won first prize for his home-grown tomatoes. Echoes - The Best of Pink Floyd. The context, colour and comedy behind the 2015 Election.